Radio silence from Drywell HQ, right? That's just because my head's been down, furious working on all new, all original, all meaty artwork for my very first solo art show, MEAT MARKET. (official press release thingie below). I am beyond excited. And also very hungry. Looking at and drawing meat all day is creating drool stains on my desk. I've rarely ever sold original artwork, so it has been exciting and challenging to create so many for the show. And I think they are pretty awesome. I'll be revealing some works in the days leading up to the show! MEAT MARKET will be held at the ever-lovely Pot+Pantry kitchen shop in the Mission. The show will be up for a couple of weeks, but you really want to come to the opening night reception on Friday, May 6th from 6 to 9pm. There will be tasty, meaty snacks (perhaps some homemade goodies by me??) and drinks, and because I have a street food fetish, some awesomesauce street food vendors will be set up outside, selling their deliciousness. So come one, come all, to Pot + Pantry on Friday May 6th, and have your mind blown by meat art. 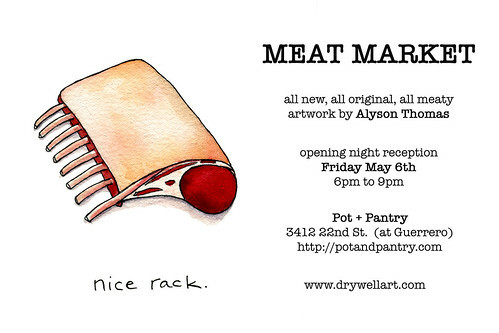 ‘Meat Market’ - a solo art show from Alyson Thomas of Drywell Art - is debuting in all its meaty glory at an opening reception at Pot + Pantry on Friday, May 6, 2011 from 6:00-9:00 pm. The show will feature all original, all new, and all quirky meat art. This show is definitely NSFV (not safe for vegetarians). The reception will feature some free treats and drinks, as well as food from local street food vendors - including awesome savory and sweet meat treats from NoshThis - for sale outside, you know, on the streets. Alyson Thomas creates both realistic and fantastical butchery diagrams. She left her job as an Asylum Officer for the US Government in a very un-well-thought-out plan to have a more creative life. In 2010, she started a daily drawing project - Meat Sections - where she drew hundreds of butchery-style diagrams. Among her most popular works are the “Meat My City” series of posters including “San Francisco is for Carnivores.” Her website is www.drywellart.com. Pot + Pantry is a kitchen boutique in the Mission neighborhood in San Francisco, owned by Donna Suh Wageman, that specializes in new and gently used kitchenware. They also carry a small assortment of food products from local artisans. Pot and Pantry located at 3412 22nd Street San Francisco, CA 94110.